Dubai is a grand city known for its majestic towers and glittering sky scrapers, filed neatly along the city's landscape. The city attracts millions of visitors worldwide, hoping to find home in the subtropical environment filled with beaches and sunshine. With over 900 high-rise towers to its name, it's no surprise there is an ample of apartments to rent in Dubai. Since the diverse city serves communities with various backgrounds, jobs and budgets; apartments for rent in Dubai come tailor-made for you. In terms of high-end rental listings, areas such as Downtown Dubai, Jumeirah Beach Residences, Barsha Heights and Jumeirah Lake Towers all offer unique experiences for its residents. Downtown Dubai provides home to the world's tallest tower - Burj Khalifa. Alongside the tower, the area has become a tourist hotspot thanks to the Dubai Fountain, Dubai Mall and the many hundreds of high-end fashion brands and cafes. In the midst for towers and urban environment, Jumeirah Lake Towers, Jumeirah Beach Residences and Dubai Marina include green areas for relaxation, exercise and overall well-being. For those looking for low-cost apartment for rent in Dubai, areas such as Al Nahda, Discovery Gardens, Abu Hail, Al Awir and Dubai International City offer more affordable rental units. Al Awir is well-known for its reasonably priced studios for rent. Areas such as Al Nahda and Abu Hail have their own Metro stations to make commuting around the city easier. Inspired by the traditional carpets of Middle East, International City is designed in clusters of countries from around the world offering well-designed apartments for rent in Dubai. Just as the name sounds, Discovery Gardens is a luxurious green area, home to multicultural families. The family orientated area provides some of the best 1 and 2-bedroom apartments for rent in Dubai. Studio apartments for rent in Dubai are suitable for single expats and residents who either prefer privacy, affordability or a short stay. Areas such as Business Bay, Dubai Silicon Oasis and Jumeirah Village Circle provide rental spaces ranging from 400 sq. ft. to 1000 sq. ft. Business Bay is the central business district in the city, allowing residents to cut down on commuting hours. Dubai Silicon Oasis, on the other hand, is a more up and coming area of the city. Areas like Deira and Bur Dubai offer rentals at a lower cost. For those having trouble with the location need not worry. Deira even has its own metro station for ease. If you're looking for an easy, quick renting and don't have time for furniture hunting, renting furnished studios in Dubai is the way to go. High-end areas like Dubai Marina, Jumeirah Beach Residences and Palm Jumeirah have taken advantage of the popular furnished studio trend and provide luxurious, five-star-style furnished apartments for rent in Dubai. Nevertheless, whether you're looking for high-end or low-end rentals, you'll find that while you rent apartment in Dubai, the buildings often provide numerous amenities. Most landlords provide gyms, swimming pools, sheltered parking, 24-hour security service, and more within the building. Many eateries all around the city offer home-delivery as well. The emirate is a popular hub for events, parties and activities catered to the diverse communities present. Luckily, DubaiRent.com caters to all of your needs as a singleton, couple or a family. We help you find the perfect apartment for rent in Dubai for you to call your new home. Since we offer so many options for our users to limit their query, our clients can identify the exact location they want to look in. Our blog provides our readers with the unique in-depth area guides of residential areas all over the city. We also share moving tips, what to look out for while renting in Dubai and much more. Luckily, DubaiRent.com caters to all of your needs as a singleton, couple or a family. We help you find the perfect apartment in Dubai for you to call your new home. Since we offer so many options for our users to limit their query, our clients can identify the exact location they want to look in. Our blog provides our readers with the unique in-depth area guides of residential areas all over the city. We also share moving tips, what to look out for while renting in Dubai and much more. Whether you are looking for a new office or shop, finding the right commercial property is vital to your business’s success. Since Dubai is quickly becoming the world’s commercial hub, there is no better place to settle your new company in. The city offers properties with a fresh and energetic outlook, with a high-standard glazed appearance which is perfect for any organization to bloom within. Choosing the right office for rent in Dubai is crucial since the city provides many options, depending on your company type. The city offers an abundance of free zones where corporations do not require local sponsors to set up their businesses. Dubai Airport Free zone, (DIFC), Jebel Ali Free Zone Authority, (JAFZA); are all examples of the many free zones available. Areas like Dubai Airport Free Zone offer their metro station – a critical aspect to keep in mind for companies with many customer visitations. Meanwhile, for businesses focusing on retail or food – areas like Deira, Al Barsha, Jumeirah, Business Bay, offer prime shops. These areas not only attract tourists but are also known for their shopping and food scene. Many small-scale eateries have opened up in the last few years and do quite well, simply because these areas lie in the food heart of Dubai. Furthermore, access to and from these areas is quick and easy, allowing deliveries and takeaways efficiently. Retail spaces for rent include Dubai International Festival City, Dubai Marina and Dubai Media City which deliver a memorable in-store experience for retail companies. Apart from being the world’s corporate hub, Dubai has etched its name in the industrial sector as well. Warehouses span across the emirate in areas such as Al Qusais, Al Quoz and Dubai Investment Park. Moreover, warehouses in Jebel Ali are suitably located near the Jebel Ali Port. 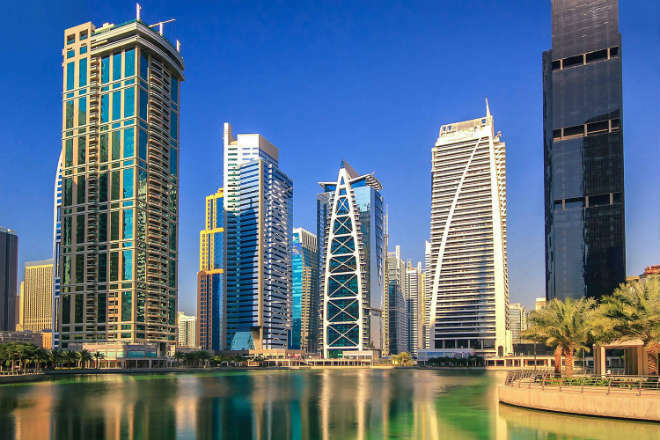 Nevertheless, DubaiRent.com assists you in finding the perfect office or shop for rent in Dubai by offering different availabilities fitting your company and budget requirements. Our team is dedicated to providing our clients with the best possible rental property to fit their needs. Why Should you rent a Villa in Dubai? Although Dubai is known for its majestic tower, Burj Khalifa and its impressive apartment scene, the emirate has invested in stunning villas for its diverse population. In order to get the most of living in Dubai, renting a villa is the best option – with many offering you panoramic views of the beaches and golf courses, gated communities, private pools and garden, large spaces and a luxurious way of living. These villas are carefully crafted and designed to suit the weather conditions and are unique, mirroring some of the best architectural techniques from the rest of the world. Dubai is known for its luxurious lifestyle so why don’t you hop on the train as well? Villas in Dubai share a need to serve and build strong communities, offer exclusive living and being pet-friendly. They all offer shopping hotspots at a close distance and lush green areas of living. Among many other facilities in terms of transport and living, Dubai presents a multicultural population, scattered cafes and restaurants, all-year sunshine and multiple events all year long. Villas come in all shapes and forms, catered to your individual needs. Depending on your whether you enjoy the secluded living style of Emirates Hills or enjoy having ambiance in your surroundings in Al Barsha, Dubai offers them all. The villas available take inspiration from European style housing, traditional Arabian housing and often add a modern twist to them. Since Dubai is known for its sun-lit weather all year long, living near beaches is an overwhelming niche. Umm Sequim offers a villa-exclusive community surrounded by water sports and beaches. Still under development, Dubai Land villas are stylish and modern. Meanwhile, the most popular area for villas for rent in a recent survey, Mirdif seems to offer it all. Villas in Mirdif are inspired by Arabian architecture and stands as a well-connected area with schools, metro links and restaurants. Built with International architecture in mind, villas in Jumeirah offers private beaches and distinct interiors within the villas. Other popular areas include The Springs, Arabian Ranches, The Meadows and Silicon Oasis. Villa tenants in Dubai value their privacy and so most villas are developed in a community-style living, wherein the cluster of villas are secluded but also close enough to other amenities. With security patrolling the compound all day long, safety is the utmost importance. Furnished villas for rent in Dubai are perfect for those with large families hoping to move at a restricted time. Basketball courts, private landscaped gardens and barbeque areas, besides the facilities usually found such as parking, swimming pool and cycling tracks are available. Most areas also offer multiple mosques and bus stands for easy transportation services. Luxury villas for rent in Dubai are available in Emirates Hills, a prestigious gated community whose name is inspired by one of the most luxurious areas of U.S.A, Beverly Hills. A safe, but close enough distance from two highways, the area provides a panoramic view across the upmarket Montgomerie Championship Golf Course. Palm Jumeirah is another impressive area within which the top luxury villas in Dubai are located. Depending on the size, these villas offer multiple storage rooms, furnished kitchens, cinema halls, golf courses and private saunas. These villas are uniquely designed by internationally acclaimed architects and use top of the market materials, so the hefty price tag is worth it. Considering the many number of bedrooms available within each villa in these areas, living within Emirates Hills or Palm Jumeirah would be suitable for large joint families as well. Low-end in our dictionary does not refer to the quality but rather, the price. The following villas mentioned are rented at a lower price compared to the average AED300K rental price of higher-end villas. The Springs offer villas for rent at a lower cost as well. Lined with lush green trees, the community offers security, pool access, lake views and multiple parking depending on the number of bedrooms. Silicon Oasis, Mirdif and Dubai Waterfront all provide 2-bedroom villas, three-bedroom villas and 4-bedroom villas for rent at a more affordable price. The three-bedroom villas for rent available at Sahara Meadows and Jumeirah Park are inspired by traditional Arabic housing and offer exclusive blends of modern architecture Dubai is known for. DubaiRent.com can help decide the perfect villa for you quickly and efficiently, despite the seemingly overwhelming options Dubai offers. To ensure easy access and the growing interest in renting villas, we dedicate a separate option for villas for rent in Dubai, categorized by the number of bedrooms, price range and other facilities you require. Our area guides will help our viewers understand what each area in Dubai offers and what they can expect living in Dubai. Moreover, a Rental Inquiry Form is available on our website to help make your search experience a quick and easy process. A true statement of the extravagance and architectural masterpieces Dubai is famous for; the Dubai Marina is a true work of art. Self-described as the ‘most luxurious man-made marina in the world’, the artificial city borders along a two-mile stretch of the Persian Gulf shoreline. Dubai Marina is tucked between Jumeirah Lake Towers and the Gulf coast, as well as nearby areas such as Dubai Media City. Sheikh Zayed Road is easy to access – situated six minutes away. The area hosts the Damac Properties Metro Station as well as the Dubai Marina Tram Station. Needless to say, getting to and fro Dubai Marina is pretty convenient. With over four thousand apartments to offer, there is certainly no shortage of high-class Dubai Marina apartments for rent. Dubai Marina is tucked between Jumeirah Lake Towers and the Gulf coast, as well as nearby areas such as Dubai Media City. Sheikh Zayed Road is easy to access – situated six minutes away. The area hosts the Damac Properties Metro Station as well as the Dubai Marina Tram Station. Needless to say, getting to and fro Dubai Marina is pretty convenient. With over four thousand apartments to offer, there is certainly no shortage of high-class, lavish apartments for rent in Dubai Marina. 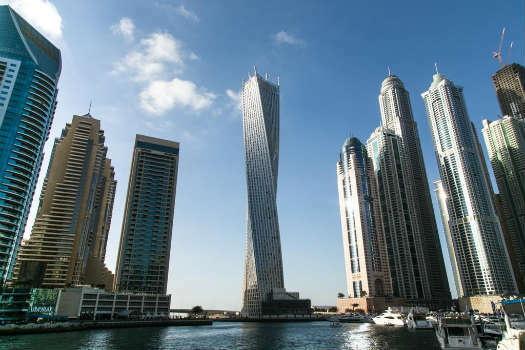 For those looking into renting a studio in Dubai Marina, rentals start at AED 50K at popular towers such as the Marina Diamonds and Marina Pearl. Moreover, furnished studios for rent are also available at the cost of AED 55K annually. A 1 bedroom apartment for rent in Dubai Marina costs an average of AED 60K at hotspots such as theManchester Towers or a higher fee at the posh Jam Marina Residence. Of course, finding fully-furnished Dubai Marina apartments for rent arenot a hassle either – Dream Tower offers plenty of one-bedroom furnished apartments for rent averaging AED 65K a year. 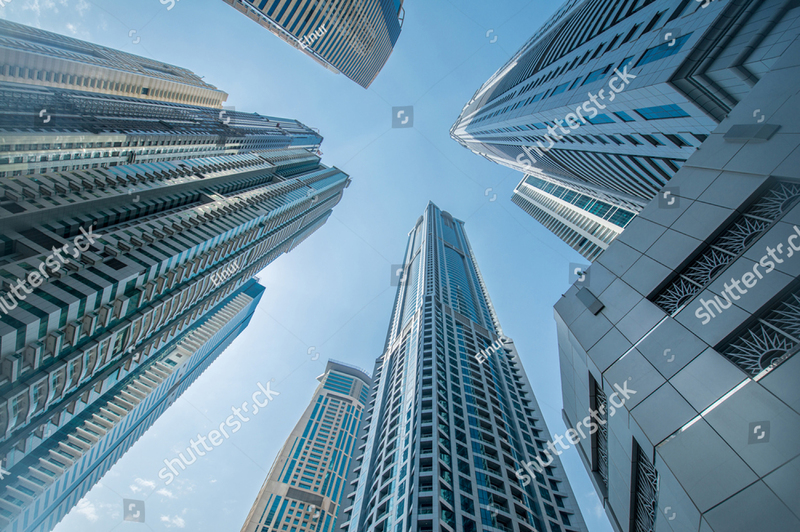 Moving up a room, 2 bedroom apartments for rent in Dubai Marina can be rented at an average AED80K, the Marina Pinnacle and The Torch being prime hotspots.3 bedroom apartments for rent in Dubai Marina are priced at an average AED 115K; popular buildings include 23 MarinaandSulafa Tower. It’s not uncommon to find towers dedicate floors to residential apartments and others for hotels. The Marina 101, in particular, houses the five-star Hard Rock hotel within its lower 33 floors. This is an added bonus if you’ve got plenty of family coming over. As expected, the area offers great facilities to its tenants that include state-of-the-art gymnasiums, private swimming pools and Jacuzzis, gaming rooms that include Squash and Pool tables, 24-hour strict security and stunning views of the Marina. Certain towers such as the Marina 101are split into residential apartments as well as hotels so, it’s easier for visiting family to stay within the same building. As expected, the area offers great facilities to its tenants that include state-of-the-art gymnasiums, private swimming pools and Jacuzzis, gaming rooms that include Squash and Pool tables, 24-hour strict security and stunning views of the Marina. Certain towers such as the Marina 101 are split into residential apartments as well as hotels so, its easier for visiting family to stay within the same building. Why Rent an Apartment in Dubai Marina? Dubai Marina is the pinnacle of what Dubai is known for. You can enjoy all-year-round unique entertainment opportunities, stunning views of the waterfront and the glittering towers with bright lights to encompass your home. As mentioned before, in Dubai Marina apartments for rent include numerous facilities. Ensuring you’re getting your money’s worth, the apartments within the development are spacious and rarely ever offer an opportunity for maintenance issues. Moreover, your home will be surrounded by hundreds of attractions that include the Dubai Marina Mall, The Marina Walk, the XLine Dubai Marinaand Emirates Golf Course. The community is party-loving and easy-going so a night out in town will never be a bore. The XL Dubai night-club is jam-packed throughout the week. Thanks to its multiple tourist attractions, Dubai Marina has plenty of high-class hotels to offer including the ultra-luxurious, five-star Address Dubai Marina hotel and others such as Radisson Blu Residence Dubai Marina. Another added bonus of the unique community that dwells in Dubai Marina is the plethora of restaurants and other eateries. From Mediterranean food in Operation: Falafel to the refined French bar Atelier M at Pier 7, Dubai Marina has got them all. Certainly, a self-serving man-made wonder, it’s not surprising the Dubai Marina is so highly sought after. One of Dubai’s most treasured architectural masterpieces built wholly by man and embedded in luxury, the Dubai Marina is a beauty. This artificial city traces along a two-mile stretch of the Persian Gulf shoreline. Unlike other unapologetically urban areas of Dubai, Dubai Marina prides in blurring the lines between nature and urbanization. Strategically placed in Dubai’s busiest commercial areas, Dubai Marina lies between Jumeirah Lake Towers and the coast. Its famous neighbors include Dubai Internet City and Dubai Media City. An easy-to-access Sheikh Zayed Road is present six minutes away. Much like most of Dubai, public transportation is a breeze. Within Dubai Marina, Damac Properties Metro Station and Dubai Marina Tram stations are the go-to means of public transport. If you’re searching for villas in Dubai, villas in Dubai Marina are a true goldmine. Built with the public’s needs in mind, it is no surprise that there are villas in Dubai Marina. Although villas within the waterfront development seem scarce in comparison to the thousand or so apartments that Dubai Marina offers, several developments such as Marina Quays Villas, Al Mass Villas and Al Yass all provide unique living spaces catered to your needs. The Marina Pomerade also joins the club of these high-class villas with views of the marina. Three-bedroom villas in Dubai Marina can be rented at an average AED 250K annually. Meanwhile, four-bedroom villas for rent and five-bedroom villas for rent are priced at AED 320K and AED 350K respectively. These Dubai Marina villas for rent are definitely worth the hefty price tag with facilities that include private gardens, barbeque areas, study and maid rooms, children’s play areas and the usual swimming pool availability. These villas are nothing short of a luxurious lifestyle and a unique living experience within a man-made and natural wonder. Why Rent a Villa in Dubai Marina? The fast-paced enjoyable lifestyle that Dubai has marketed itself on the global map is easily found here in Dubai Marina. In Dubai Marina, villas for rent offer unobstructed views of the bay and inimitable architectural designs, living within the villas in the area is a true life of luxury. If you enjoy nature and prefer to be surrounded by greenery, these villas offer multiple opportunities to enhance your backyard gardens. Dubai Marina villas for rent are all large and spacious, providing more than just the three bedrooms you’d rent – they offer maid rooms, play areas and study rooms as well. 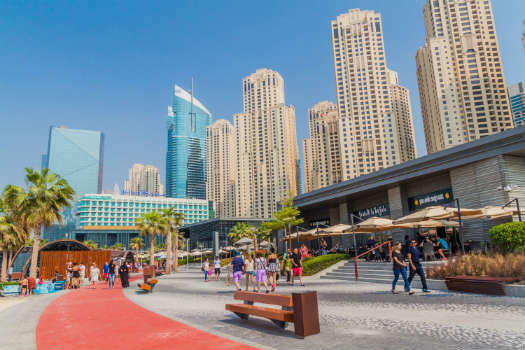 Additionally, Dubai Marina is littered with multiple entertainment options that include the Dubai Marina Mall, The Marina Walk, the XLine Dubai Marinaand the infamous Emirates Golf Course. The entrepreneurial and young community is party-loving and pretty laidback. Be rest assured, a night out will never be a bore. There are plenty of gym and healthy eateries within the neighborhood as well. 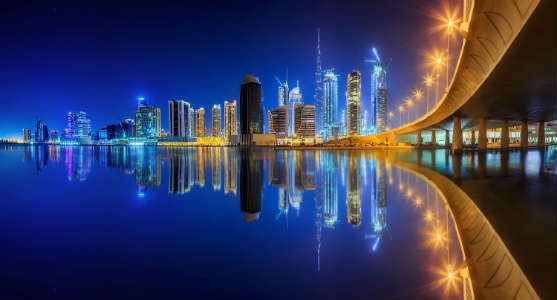 Since Dubai Marina in itself is a tourist attraction, there’s a plethora of high-class hotels such as the ultra-luxurious, five-star Address Dubai Marina hotel and others such as Radisson Blu Residence Dubai Marina. Another added bonus of the unique community that dwells in Dubai Marina is the high number of restaurants and other eateries. One can find all sorts of high-end and affordable eateries ranging from American cuisine to Mediterranean and Asian cousins. The top-rated restaurant within the community is Azure Beach. With all these great amenities and the lifestyle Dubai Marina offers, it’s no surprise it’s one of Dubai’s most sought-after neighborhoods. Downtown Dubai, the hub for Dubai’s greatest accomplishments, is really hard-to-miss. Home to the iconic statures of Burj Khalifa and Dubai Mall, this neighbourhood is exclusive for the elites of this nation. Instead of being embellished in gold ornaments and structures, Downtown Dubai has gone for a more classy and sophisticated-modern look with silver, sleek, tall buildings crowding the skyline. The vicinity is situated along Sheikh Zayed Road (E11), with Business Bay situated to its south, Al Wasl to its northwest and Financial Centre to its northeast. Given its massive popularity and demand, the area is packed with multiple public transportation and road access options. The Burj Khalifa/Dubai Mall Metro Station is present, along with The Dubai Trolley that takes you to all the major tourist hotspots within Mohammed Bin Rashid Boulevard. Still, the developers – Emaar Properties – have designed the district with miles of pedestrian walking systems. Downtown Dubai apartments for rent are plentiful and offer varying degrees of bedrooms, from unfurnished studios at Burj Views and furnished five-star studio offerings at The Address Dubai Mall, to four-bedroom apartments in The Burj Place, they’ve got something for everyone. Furnished studios for rent in Downtown Dubai cost AED 90k while unfurnished studios can be rented at AED 65k on average. A one-bedroom apartment for rent in Downtown Dubai is tagged an average AED 110k annually, popular in Burj Vista. Meanwhile, two-bedroom and three-bedroom apartments, popular in buildings such as Burj Khalifa Area and The Residences, cost AED85K to 150K, and AED150K to AED250K yearly. The area is well-known for short-term and quick rentals, therefore, multiple furnished apartments for rent are available in the area. 2-bedroom furnished apartments range from AED95K to AED 180K, while furnished 3-bedroom apartments are available for rent between AED130K to AED300K. Unsurprisingly, Downtown Dubai apartments offer more than just the apartment itself. Besides being larger than average apartments around Dubai, tenants are offered pool services, gym and parking amenities, as well as, stunning views of the Dubai Fountain and Burj Khalifa. Each of the aforementioned buildings offer unique services - Burj Views offers its own theatre and squash court, Burj Vista provides billiard tables and a BBQ Area while The Residences provide their own steam room. Although the area has high rental prices compared to other areas within the city, apartments for rent in Downtown Dubai are quite simply unrivalled. Why Rent in Downtown Dubai? Living in Downtown Dubai comes with its perks. Not only does living in the neighbourhood put you higher up in the society’s ranks, the area is designed for multiple entertainment options every day. Majority of the tenants in the area lead fast-paced lives and are inclined to visit the many popular hubs in the area. Dubai Opera has hosted legends from all around the world, Downtown Slide presents a perfect opportunity to let your inner-child free, Downtown Dubai Art Gallery will captivate you with its ever-changing sculptures, and of course, the infamous Dubai Fountain leaves everyone speechless thanks to the waters graceful dance and loud melodies. The area is pet-friendly, fitness-friendly and offers a plethora of global cuisines to cater to its multicultural residents. Downtown Dubai is a great location to live in for those who work in areas such as Business Bay, Dubai International Festival City or Al Wasl. Although standard hospitals, spas and clinics are available in the neighbourhood, Downtown Dubai introduces multiple unique physical health and beauty using inspirations from all around the world. The area also offers some of the best schools within the UAE. With over two-hundred-thousand people flocking to the streets of Downtown Dubai, one must be convinced that the hype around Dubai’s treasured location is true and well-deserved. Downtown Dubai has been aptly dubbed as the centre of Dubai – fast-paced and intensely busy, the lifestyle of individuals here is like no other. With nearly 15 million tourists flocking to Dubai each year, and a large percentage visiting Downtown Dubai, having a business established in the neighbourhood allows for high sales and exposure. 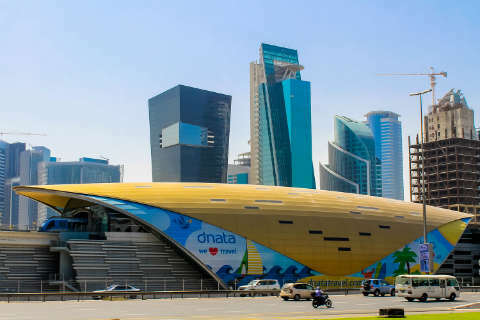 Not only does the area host the world’s largest mall – The Dubai Mall – but also, numerous tourist hotspots such as the Dubai Fountain, The Burj Khalifa, Calabar Lounge, Dubai Aquarium and Underwater Zoo among many others. The development is multi-purpose, facilitating needs of both residents through the provision of high-class apartments and also businesses through the provision of large-space offices, all in a prime location. Developed by Emaar Properties, Downtown Dubai has become a focal of New Dubai. Situated along the stretch of the E11 or Sheikh Zayed Road, the neighbourhood is surrounded by new and upcoming developments. Al Wasl lies northwest, Financial Centre to the northeast, and Business Bay to its south. Besides the plethora of taxis and buses that continuously circle the vicinity, Downtown Dubai has its own metro station – the Burj Khalifa/Dubai Mall station. Office spaces for rent in Downtown Dubai vary in size and structure, and their cost can range according to the square feet and the type of office. Shell and core offices can be rented between AED380K to AED550K annually. Shell and core offices only provide the basic structure of the buildings and allow new tenants to design the fittings and build of the rental. Meanwhile, fully fitted offices can cost between AED600K to AED850K. 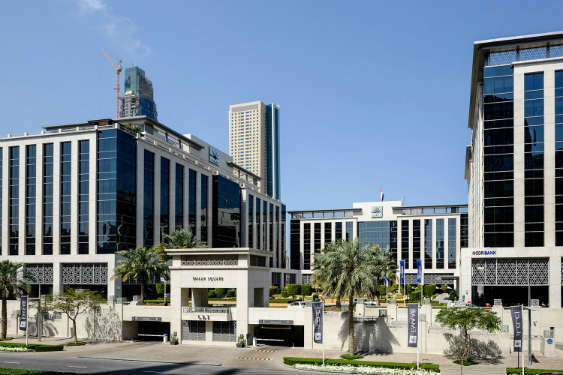 Although offices for rent are scattered within Downtown Dubai, the Boulevard Plaza Towers and Emaar Square have plenty of offerings available and present to be a popular commercial centre. Emaar Square is highly sought after due to its prime location (nearby metro, close areas such as DIFC and DWTC) and elegant build. Office rentals in the neighbourhood are accompanied with conference room(s) and other amenities such as in-building dining options, Wi-Fi services, cleaning services and parking. 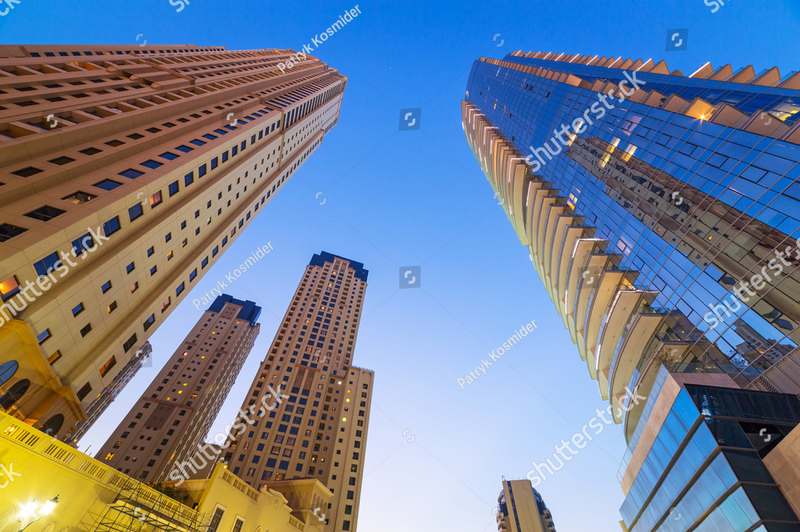 Shops and retail spaces for rent in Downtown Dubai are plenty and, just like office spaces, do not have a specific location but are instead spread around the neighbourhood. These shops dependant on the square feet, can range from AED180K to AED1700K each year. Why rent Commercial Spaces in Downtown Dubai? Retail, Offices and Commercial spaces for rent in Downtown Dubai are ever-growing, offering businesses large crowds and high status. The development is jam-packed with easy-to-access roads and locations that remain up-to-date and are easy to find. Moreover, businesses with customers visiting from abroad have plenty to show around the area. 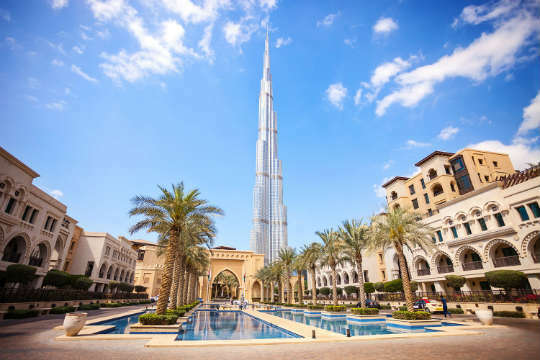 Hotels are common in Downtown Dubai, 5-star offerings of the iconic Burj Khalifa and Armani Hotel Dubai, while other affordable options such as Ramada Downtown Dubai or Dusit Thani Dubai are also present. 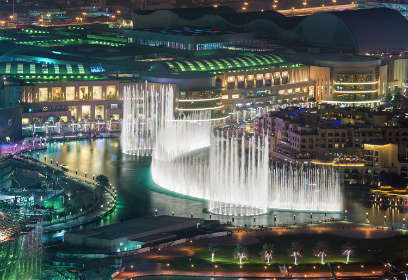 Entertainment options are available for guests such as the Art Galleria in Downtown Dubai or the world’s largest mall – Dubai Mall. Since Downtown Dubai is such a tourist hotspot, there is no shortage of clinics, supermarkets, cafes, hospitals or chic dining options. Offices within the area have an array of eating and dining options to choose from, with multiple eateries of international cuisines available. Residents, employees and tourists that residing in Downtown Dubai are often young, eccentric and energetic. Retail stores and shops are at an advantage with a modern crowd offering great exposure. Moreover, celebrity and high-class socialites live within the area and are sure to help businesses thrive. Downtown Dubai has quickly become the heart of Dubai, and businesses no doubt benefit from its grand reputation. The largest and most luxurious of its kind, Palm Jumeirah is a tree-shaped set of islands built on the Persian Gulf, along the shore of Jumeirah. It has been divided into three primary constituents – the trunk, the crown and a crescent surrounding island. The crown houses over four-thousand luxury villas, owned by international investors and elite populations. 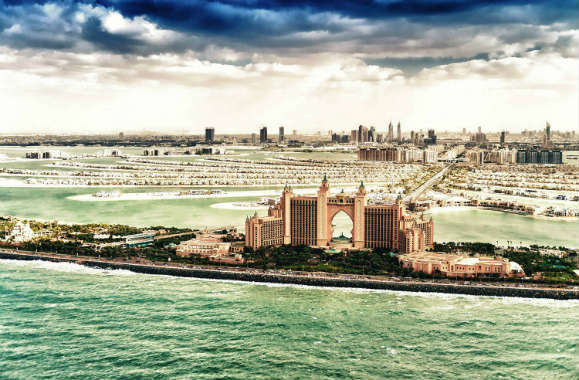 The island is home to various landmarks of Dubai – Aquaventure Waterpark, Atlantis The Palm and Jumeirah Zabeel Saray. Public transportation to the coast is through the local monorail but nearby tram stations include Palm Jumeirah Tram Station and Nakheel Metro Station. Getting to the island by car is no hassle either, use exit 39 for Palm Jumeirah while driving on the Shaikh Zayed Road. Jumeriah Beach Road is another popular route used to get to the island. Often built on the beach, Palm Jumeirah villas are extravagant and modern, mixing multiple architectural influences such as the Middle East and Europe. The island largely offers villas consisting of four-bedrooms and higher. A four-bedroom villa for rent in Palm Jumeirah is tagged at AED 300K per year. Garden Homes is the most popular villa vicinity on the island. Each of the villas within the neighbourhood are provided with two garage spaces, swimming pool and a private garden. 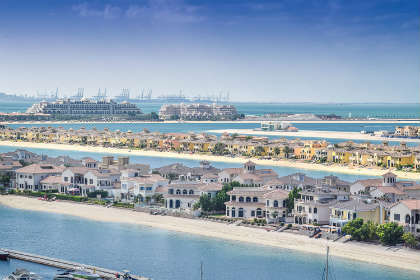 Meanwhile, five and six-bedroom villas within Palm Jumeirah will cost AED 450K and AED 650K annually. While Garden Homes also provides five-bedroom villas, Signature Villas and Canal Cove Villas are other alternatives. Signature Villas offer direct-beach access to its residents and is pet-friendly while the Canal Cove is popular due to its affordability and multiple facilities such as gyms and spa services. Not shying away from short term offerings, there are plenty of short-term villa rentals in Palm Jumeirah. With payments due at the end of every month, average rental fees for a four-bedroom villa is AED 59k. These villas are often furnished and popular among tourists, thus, offer plenty of extra facilities such as airport pick-up services, tours and more. 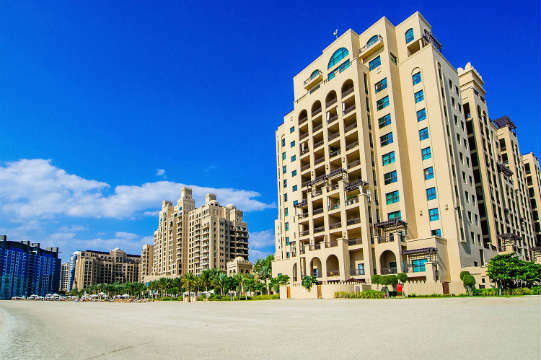 Why rent villas in Palm Jumeirah? Palm Jumeirah has an ideal location, not too close to the city centre (Downtown Dubai) but neither too far, making it perfect for those working in Dubai Marina, Dubai Internet City or Al Sufouh. The area caters to its international population and has plenty of leisure activities to keep the residents busy all year long. Sea Lion Point, The Lost Chambers Aquarium, Dolphin Bay, Blue Coast Dive Center are just a few establishments that offer a haven to thrill-seekers. The island is home to multiple highly-rated resorts such as Sofitel Dubai The Palm, Waldorf Astoria Dubai Palm Jumeirah and Anantara The Palm – all situated alongside the beach and filled with lush landscapes and oceanic views. The island is well-loved by upper-class individuals and offers a unique lifestyle to its residents. Thanks to its multiple resorts and hotels, living in Palm Jumeirah is a holiday experience. There is no shortage of supermarkets, hospitals or any other common amenities as the developers have made sure to create a self-serving island. The Palm Jumeirah joins Dubai’s long list of architectural wonders. Extending into the Persian Gulf, The Palm Jumeirah is the world’s largest man-made island which, when viewed from above, resembles a palm tree. Most apartments and residential developments are present on the ‘trunk’ of the island, while the ‘crown’ is largely dedicated to high-end villas. 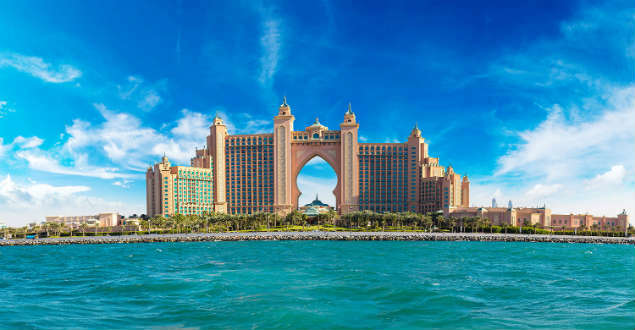 Self-declared as the eighth wonder of the world, the island hosts multiple luxurious and grand establishments such as Atlantis, The Palm and Fairmount, The Palm. The area is well-suited for young business professional and entrepreneurs. Nearby areas include Dubai Internet City. Dubai Marina and Al Sufouh. The island itself is not connected to the rest of Dubai by a metro. However, it has its own monorail - Gateway Station and Atlantis Aquaventure Stations are your best bet. Still, the Palm Jumeirah Tram Station and Nakheel Metro Station will connect you to the nearest monorails of The Palm. AED 145K and AED 175K yearly at The Marina Residences and Oceana, both offering incredible waterfront views. Tenants at the Oceana also have access to private beaches and various health clubs. Short term apartments for rent in Palm Jumeirah are also available, with most rent payments due every month. Tiara Residences offers such short-term rentals at AED 18K per month for two-bedroom apartments and provides luxury spa facilities, cleaning services, multiple gaming options, private beach access and day care facilities. Furnished apartments for rent are ever-present at multiple locations around the island, averaging at AED 160K annually for two-bedroom living spaces. The Fairmont Palm Residences is a great option through its provision of walk-in closets, guest rooms, maid rooms and architectural detailing. Why rent apartments in Palm Jumeirah? Palm Jumeirah offers a peaceful retreat and is perfect for families or individuals that want to live away from the hustle and bustle of Dubai. Majority (if not all) of the Palm Jumeirah apartments offer beachfront living and scenic ocean views which results in various entertainment options for the residents; luxury spas, paddle boarding, kayaking, fly boarding, wind surfing, paragliding – the options are limitless. Moreover, the island is filled with adventurous activities such as swimming with the sharks at The Atlantis or snorkelling with over 60,000 marine animals at the The Lost Chambers Aquarium. Despite being an island, Palm Jumeirah is quite self-sufficient. Golden Mile Galleria is a popular choice for shopping, standing as the first shopping destination on the island. Thanks to Palm Jumeirah attracting residents and investors from all over the world, restaurants and cafes have lots of options to choose from to cater to all nationalities. 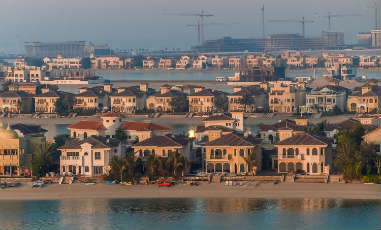 The area is home to international socialites thanks to Palm Jumeirah’s lifestyle that appeals to the rich and famous. All the developments in the area are using the best materials, world-class amenities and unique designs. With all that being said, it’s safe to assume that Palm Jumeirah is the epitome of Dubai’s luxurious lifestyle. Located at the south of Downtown Dubai and surrounded by Al Quoz and Al Safa, Business Bay is quite simply the NYC business hub of Dubai. The area is popular among young expat professionals due to the area’s high commercial nature. Still, plenty of world-class residential options are offered to the public. Business Bay has its own metro station – Business Bay Station and is a short ten-minute drive from Dubai Mall and DIFC. Moreover, the neighbourhood can be accessed using Sheikh Zayed Road and Al Khail Road. Often present in high-rise, glossy-silver towers, a plethora of different styles of Business Bay apartments for rent. Regardless of the living space being furnished or unfurnished, short-term or long-term, this neighbourhood has something to offer. Starting with the unfurnished options, studio apartments in the development are tagged at AED 55K for a yearly rental period. Short-term studio rentals will cost AED 6.5K per month in the area. Meanwhile, 1 bedroom for rent in Business Bay have a rental price of AED 65K and are popular in The Ubora Residential Towers. The Uborabuildings are divided into two individual towers – one dedicated to commercial spaces and the other to residential. Residents of the tower can enjoy a fully-equipped kitchen during move-in and serene views of the canal. 2 bedroom apartments for rent in Business Bay cost AED 98K while three-bedroom spaces can cost AED 145K annually. Executive Towers are a popular choice thanks to their retail services on-site, views of the BurjKhalifa and easy access to the Sheikh Zayed Road. Bayz Tower and Mayfair Towers are other popular options for both two and three-bedroom living spaces. Furnished Business Bay apartments for rent can cost AED 60K for studios, AED 80K for one-bedroom rentals, AED 115K for two-bedroom rentals and AED 165K for three-bedroom rentals. Although Executive Towers also provide furnished options, Capital Bay Towers and DAMAC MaisonThe Vogue also do so. At The Vogue, one can enjoy uninterrupted views of The Marasi Yacht club and The Dubai Canal. Meanwhile, Capital Bay Towers offer private jacuzzi and a shared gym among other amenities. Why rent apartments in Business Bay? There are several reasons why Business Bay apartments for rent are well loved by its residents. Starting off with its close proximity to the city centre of Dubai – Downtown Dubai. Employees of companies based in Business Bay, Downtown Dubai, Dubai International Festival City will all benefit from living within this neighbourhood. Because of the area’s overwhelming young population leading fast-paced lifestyles, Business Bay has plenty of retail and entertainment options for those who want some time off. Bay Avenue Mall is the local mall, although the world’s largest mall – Dubai Mall – is also right around the corner. Internationally acclaimed hotels such as the Steigenberger Hotel and The Ritz-Carlton Residences are also built within the neighbourhood which is great for people who have clients or family visiting frequently. VIP Room Dubai is a popular spot for young professionals to wind off and have a good night. 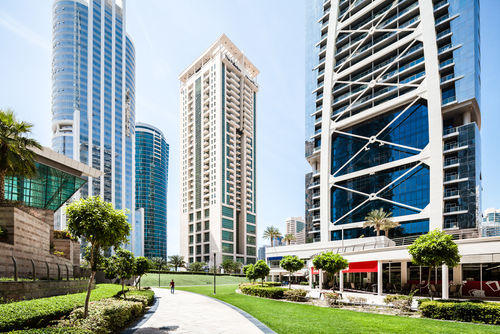 Business Bay also hosts its own park - Bay Avenue Park. With the upcoming Marasi Business Bay project built in the Dubai Canal offering floating water homes and five marinas, Business Bay certainly has no plans to stop serving its residents. A true testament to its name, Business Bay has quickly become the major commercial hub of Dubai. Developed close to the heart of Dubai – Downtown Dubai, the area is surrounded by Al Wasl up north, Al Quoz to the south and Al Safa to its west. The area is home to over 240 (and growing) towers of different sorts – commercial, residential and mixed. Plenty of top international firms have setup their offices, basking in its unsuppressed amenities. Popular among young professionals and highly-motivated employees, the area has certainly catered to the needs of its demographic. Built with ease of accessibility for business clients and employees in mind, Business Bay can be accessed via two major highways: Sheikh Zayed Road (E11) and Al Khail Road (E44). Moreover, the area hosts its own metro station, the Business Bay station on the Red metro line. Still a relatively recent development, the properties in here are high-class and use top notch materials. Office space for rent in Business Bay depend upon the type of rental: shell and core or fully-fitted offices. Averaging AED 60K per year, shell and core offices are plentiful in this vicinity and offer great amenities. For instance, clients and business associates could benefit from a wide variety of leisure facilities at Executive Bay – there is a gymnasium, a health club, waterfront location and plenty of parking availability. Meanwhile, if you’re looking into a fully-fitted office for rent in Business Bay, the tagged annual rental fee is AED 100K. Bay Square is a great choice for businesses – the newly developed 13-tower neighbourhood is only a walking distance away from Dubai Mall, hosts a four-star Hilton Hotel and is accessed via five roads: Al Khail Road, Downtown Dubai, Sheikh Zayed, DIFC, Zabeel, and Oud Metha Road. Lastly, shops for rent in Business Bay average at AED 150K annually. Both Executive Bay and Bay Square offer rental spaces, still, Capital Bay Towers and The Residences has availability too. 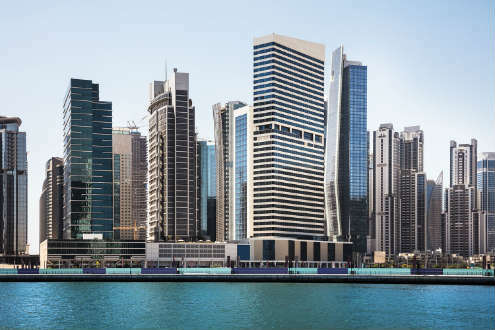 Why rent commercial properties in Business Bay? Companies or retail stores based in Business Bay can avail plenty of benefits thanks to the location itself. Bordering iconic landmarks of Dubai, the area is close to Dubai Mall, Dubai Creek, Burj Khalifa and plenty of world-class hotels such as the Radisson Blue Hotel. Having tourist hotspots and hotels close to a company is always an advantage for visiting business associates. The area also attracts plenty of tourists on a daily basis, a major advantage for shop owners within the neighbourhood. Least not forget, Business Bay offers an array of eateries, leisure hotspots and shopping centres for visitors and regulars to enjoy. Business Bay itself was built with a commercial need in mind. There is no shortage of guest parking and the towers offer multiple parking options for employees. Offices present in the vicinity are all oozing with comfort and luxury, built to motivate employees to reach their greatest potential. Add in the component of uninterrupted skyline views of the world’s greatest tower and lush landscapes, Business Bay seems like paradise to work in. Built on the south-east side of Dubai, Mirdif is known for its affordable housing and international population. Although many people believe that the development consists primarily of villas, there are plenty of low-rise apartment complexes scattered around Mirdif. In Mirdif apartments for rent are divided into three sub-communities: Uptown Mirdif, Shorooq and Ghoroob. Mirdif also houses two malls – Mirdif City Centre and Uptown Mirdif Mall, although the former is more popular among residents. Two arterial highways are built within the neighbourhood - Sheikh Mohammad Bin Zayed Road (E311) and Al Awir Road. Rashidiya Metro station, the first on the red line, is the closest metro station and has its own parking space. Nearby areas include Al Mizhar, Al Warqa and Al Rashidiya. Finding apartments for rent in Mirdif Dubai is no hassle – the area provides furnished and unfurnished studio, 1-bedroom, 2-bedroom and 3-bedroom apartments for rent. A studio apartment for rent in Mirdif Dubai is priced at AED 45K yearly. Meanwhile, 1-bedroom Mirdif apartments for rent cost an average of AED 65K annually. Mirdif Tulip is a popular and new apartment complex present in Uptown Mirdif. Tenants can enjoy walk-in closets, a 24-hour security and a shared pool. If you’re looking for 2-bedroom apartments for rent in Mirdif Dubai, Shorooq is good option – rent will cost AED 83K on a yearly basis. The community offers several sport courtyards, kids play area and a jogging track that circles the area. 3-bedroom apartments for rent in Mirdif Dubai will cost you AED 100K annually. Ghoroob has plenty of spacious 3-bedroom apartments with plenty of facilities for its tenants. 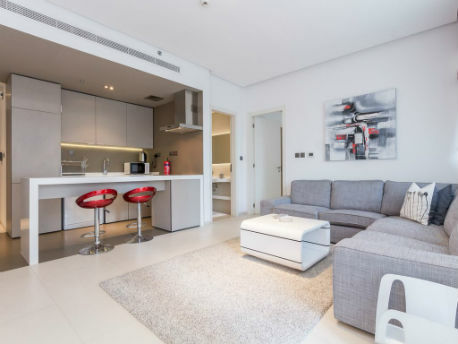 Furnished Mirdif apartments for rent are a steal, costing an average AED** for a two-bedroom living space, these apartments are spacious and are cheaper furnished options compared to others in Dubai. Courtyard Apartments in Uptown Mirdif has furnished living spaces available, with kitchen appliances, gym and beautiful views included. Why rent apartments in Mirdif? If you’re looking to rent in Mirdif, you not only benefit from its affordability, but also its community feel. Overflowing with a largely expatriate population, there is a community group or event for all sorts of hobbies and interests. Mothers and their kids meet regularly for play dates in the Mirdif Mums group, fun and games are ever-present at the Community Fun Market Day- the list goes on. Mirdif also offers a lifestyle away from the metropolitan city centre of Dubai. The area is green and lush, peaceful to the mind and perfect for those who prefer living in the suburbs. Mirdif is a prime hotspot for anyone working at Dubai International Airport, as it lies a few minutes away. Moreover, the neighbourhood serves three parks: Mushrif Park, Uptown Mirdif Park and Mirdif Park. 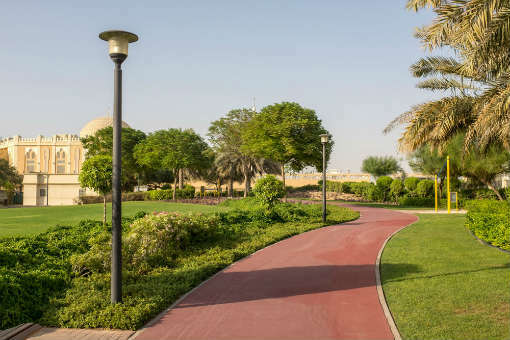 Mushrif Park is Dubai’s largest park and attracts families and couples frequently for barbeques and afternoon lunch. In terms of food and drinks, a multicultural fiesta of eateries are available and Brick bar is the local hotspot for a night out. Considering apartments for rent in Mirdif present you with multiple amenities and facilities, cheap housing and great community living, it’s no surprise they are so highly sought after. Jumeirah Village Circle, in the heart of Dubai, is a residential community that offers a modern village-like feel. Developed by Nakheel Properties and located in New Dubai, it should come as no surprise that the neighbourhood is top-rated and highly sought after. Well-maintained, stately Arab and Spanish-style villas stand in quiet elegance, forming small clusters and communities. Given the high demand for family suited neighbourhoods in Dubai, Jumeirah Village Circle Villas for rent are plenty. A two-bedroom villa for rent in Jumeirah Village Circle costs an average AED 125K. Seasons Community is a popular choice, offering serene community ambience, a covered parking space and a suitable location, right next to major Dubai highways. Nakheel Villas is another great option that provides both independent and community-style Mediterranean villas. For those looking for 3-bedroom villas for rent in Jumeirah Village Circle, the District 10 neighbourhood within JVC is a popular choice. Offering semi-furnished villas at an average cost of AED 145K, these villas are not only spacious (giving kids plenty of room to play in), but also provide tenants with kitchen appliances (such as refrigerators, dishwasher, oven and washing machine). Meanwhile, unfurnished 3-bedroom villas are offered at a lower cost – AED 130K – at neighbourhoods such as the Alfa Residence. Lastly, four-bedroom villas within the neighbourhood cost an average AED 145K. Why Rent in Jumeirah Village Circle? A large neighbourhood with affordable rentals and large spacious living spaces, Jumeriah Village Circle has found a balance between offering high-quality living space and price. The development is conveniently located next to Al Khail Road and Sheikh Zayed Road, making accessing this neighbourhood a breeze. JVC is a smart choice to settle in for those working in Dubai Media City, Dubai Internet City or even Downtown Dubai. The villas themselves have been built with care and precision, beautifully designed by some of the best architects in the industry. Most of such living spaces offer private gardens, kitchen appliances, community gymnasiums, fitness centers and plenty of covered parking spaces, all of which help cut additional costs. Towering trees and plenty of footpaths make this area an absolute delight to bike or jog through during the night. Having discussed the villa and location advantages, the Jumeirah Village Circle community should not be overlooked. One can find a mix of small and large families from varying cultural backgrounds settled in JVC, all ready to welcome new neighbours. Since Dubai is a fast-moving, it’s not often that you can find a strong community within the city. JVC, however, hosts multiple events such as the JVC Spring Carnival, Lunar Eclipse Night, Quiz Night; all that will make you feel right at home. With over thirty parks littering the neighbourhood, both children and adults can enjoy themselves at the various sports pitches. During the weekends, the residents can be found at The Els Gold Club or the Plantation Equestrian and Polo Club, both being a few minutes away. Dubai Miracle Garden is the perfect place to visit during the winters and indoor options such as The Mall of the Emirates (or the upcoming Circle Mall) are great for a day out in the summer. An exquisite area built with elegance and unparalleled craftsmanship, Jumeirah Village Circle is in the heart of Dubai. Highly competitive due to its prime location and rental prices, the development is self-sufficient. Taking inspiration from the glorious Mediterranean, Arab and Spanish architecture, Jumeirah Village Circle is a sophisticated and serene neighbourhood ideal for families and health fanatics. It is located on Sheikh Mohammed Bin Zayed Road between Hessa Street and Al Khail Road making it quite accessible from all around Dubai. A stark comparison from its neighbours (Al Barsha and Dubai Sports City), the area consists of low-rise apartment buildings. Despite being in the heart of a city, the neighbourhood provides a unique bucolic lifestyle. With over two thousand apartments for rent in Jumeirah Village Circle, there is an abundance of options and varieties. Within Jumeirah Village Circle, studio for rent is tagged at AED 38K. Most residential buildings include a mix of studios, one-bedroom and two-bedroom apartments, still, Emirates Garden is a good shout. The studios in JVC are generally more spacious than those present around Dubai and offer tempting amenities such as a steam room, roof garden and saunas. Meanwhile, 1-bedroom apartment for rent in Jumeirah Village Circle would cost AED 55K. 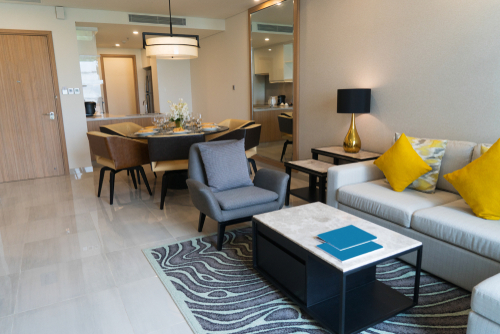 Seasons Community offers plenty of one-bedroom rentals and is a popular choice thanks to its prime location – bordered by both Al Barsha Road and Sheikh Mohammed Bin Zayed Road. 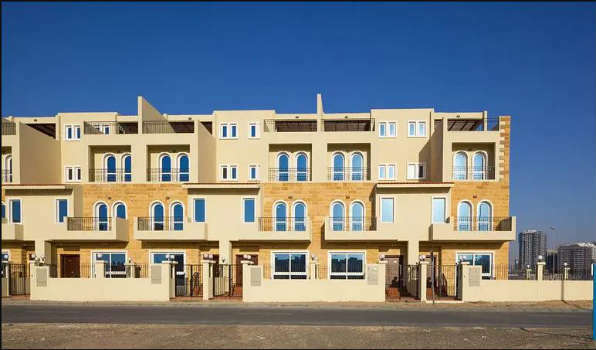 The four-building apartment complex is also popular for 2-bedroom apartment for rent in Jumeirah Village Circle. 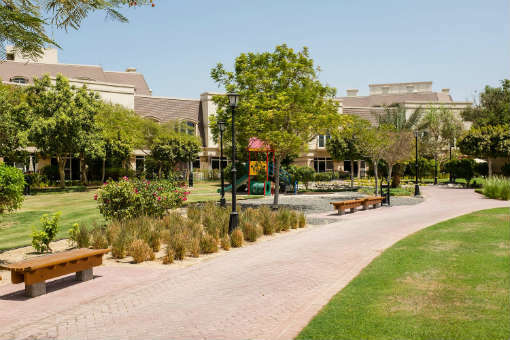 Since the neighbourhood is primarily focused on family-based living, two and three-bedroom apartments for rent in Jumeirah Village Circle are plenty. Two-bedroom apartment can be rented at AED 75K while three-bedroom apartments are tagged at AED 110K. Diamond Views offers three-bedroom rentals which are accompanied by maid rooms, additional bathrooms and fitness clubs within the vicinity. Jumeirah Village Circle is an ideal neighbourhood to settle down not just because of its affordability, but the lifestyle it offers for the price. Surrounded by and filled with plenty of green spaces and lush landscaping, the area is filled with a plethora of facilities. Sprawling entertaining spaces flow outside the residential living spaces that include The Els Golf Club, Dubai Miracle Garden and Plantation Equestrian and Polo Club. Moreover, the apartments themselves have plenty of amenities included that cut costs for finding them elsewhere. These include swimming pools, saunas, gymnasiums and barbeque areas. Mall of the Emirates is a hotspot for the residents within the neighbourhood, lying fifteen minutes away. Important for many, there are plenty of fitness facilities too, such as bicycle paths, thirty-three community parks with football and cricket grounds, and jogging pathways. Finally, Jumeirah Village Circle offers not only a living space, but also a community. Since the area is largely suited to families, the kids will have plenty of friends to play with too. Expats are popular within the area, so you will be sure to experience a mix of cultural events within the neighbourhood. Lastly, Jumeirah Village Circle would be an ideal location for those working in Dubai Internet City, Al Quoz or Al Barsha. Although developed in the early 2000s, Dubai Silicon Oasis has become increasingly popular in recent years thanks to excellent facilities, pristine buildings, lush greenery and gated communities. Owned wholly by the Dubai Government, the area is located at the intersection of Sheikh Mohammad Bin Zayed Road (E311) and Al Ain Road (E66), situated next to Academic City. Despite catering to four major sectors, the developers of Dubai Silicon Oasis have not held back on the quality of housing and living style within the area. Unlike Downtown Dubai, buildings offering apartments for rent in Silicon Oasis have toned down on the dazzle and razzle of a metropolitan city and focused on being low-rise and sustainable instead. Eager to meet the needs of its diverse clientele, the area offers multiple bedroom options, as well as furnishings to look forward to. A furnished studio apartment for rent in Silicon Oasis is tagged at an average AED 42K annually, while an unfurnished studio apartment would cost AED 30K. Apartments within Silicon Gates, a four-building complex, are in high demand due to their good management services. Moreover, the apartment complex provides more than just gym and pool services – squash rooms, billiard and snooker tables, laundry services and ample parking spaces are all part of the contract. Silicon Gates, much like its neighbour Park Terrace, also offers plenty of one-bedroom apartments for rent in Silicon Oasis. Furnished and Unfurnished one-bedroom apartments cost an average of AED 55K and AED 40K, respectively. 2-bedroom apartments for rent in Dubai Silicon Oasis can be rented at AED 75K furnished and AED 60K unfurnished. Binghatti Apartments provide plenty of two-bedroom apartments (it also offers over 90 one-bedroom rentals) and offer dedicated barbeque spots and play grounds for the kids to enjoy. 3-bedroom apartments for rent in Silicon Oasis are also available at Binghatti Apartments, averaging at AED 95K when furnished and AED 85K unfurnished. Given the recent development of Dubai Silicon Oasis, there are few maintenance issues. Why Rent in Dubai Silicon Oasis? Silicon Oasis offers an idealistic living environment for a wide variety of individuals, perhaps explaining its high popularity. Particularly, if you enjoy living near to your office, Silicon Oasis is a great option due to its high number of commercial developments. The area is also popular among young professions and entrepreneurs. Moreover, individuals working in Dubai International Airport will find residing in the area highly beneficial, considering the short journey it entails. Thanks to its proximity to Academic City and Silicon Oasis’s low-cost living, students are popular within the area as well. Lastly, the plethora of schools, nurseries and outdoor play areas available within the development have attracted plenty of small families. Speaking of outdoor play areas for kids, the newly developed North Park near the Cedre Villas offers lush greenery enveloping barbeque areas, sports facilities (tennis courts, volleyball courts and football fields) and multiple car parks for its visitors. Although the area does not have its own metro yet, the upcoming EXPO2020 has promised a dedication station to the area. There is no shortage of shopping destinations either - budget-friendly Dubai Outlet Mall and Dragon Mart are a few minutes far; the annual Global Village is also located fifteen minutes away. Since the area offers free-hold properties, the residents of the area are largely expats allowing for a multi-cultural living experience. Dubai Silicon Oasis is a government-owned free zone located at the intersection of Sheikh Mohammad Bin Zayed Road (E311) and Al Ain Road (E66), next to Academic City. Developed in 2004 but catapulted into the public eye only recently, Dubai Silicon Oasis offers revolutionary ideas and plenty of benefits for commercial developments. The free-zone development offers 100% foreign ownership, zero income and corporate tax, low share capital requirements. 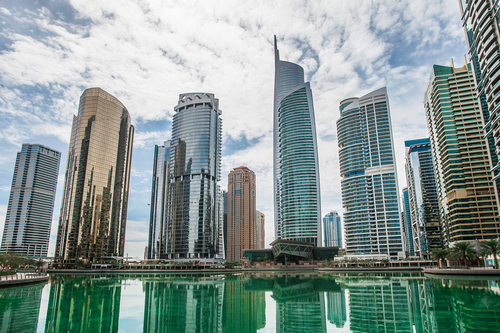 It’s hard to resist setting up a business in Dubai Silicon Oasis and it’s easy to see why. Office Space for rent in Dubai Silicon Oasis vary greatly in price depending on the size and specification of the rental. Fully fitted offices are rented at an average cost of AED 45K annually and are popular in The Apricot and The Icon. The Apricot offers stunning views of the Dubai landscape and multiple amenities crucial to office buildings – plenty of parking spaces, a beautiful waiting room for clients. Meanwhile, the newly developed The Icon offers pantry spaces, a rent-free period for fit-out works and a direct connection to Sheikh Mohammad Bin Zayed Road (E311). The Icon also houses plenty of shell and core offices at an average cost of AED 40K with similar benefits and amenities. Meanwhile, retail shops for rent in Silicon Oasis Dubai average at AED 270K annually. Retails stores are scattered around the area and there are plenty of options if you’re looking for shops for rent in Dubai Silicon Oasis. Park Avenue, Silicon Gates, Silicon Heights are just a few of the openings available. 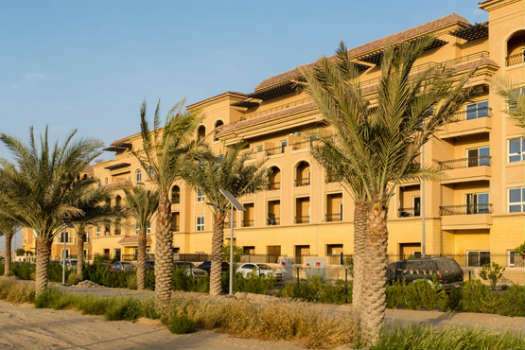 Office for rent in Silicon Oasis are a great hit among entrepreneurs and businesses primarily due to the benefits the area itself provides, more than just the commercial property. The location is an important factor for anyone looking to set up a business within an area and Dubai Silicon Oasis is prime. Fifteen minutes away from Downtown Dubai and ten minutes from Dubai International Airport, the area is perfect for companies who expect foreign clients and visitors on a regular basis.Moreover, Dubai Silicon Oasis itself is integrated into commercial and residential spaces. This allows staff members to reside close by and bask in the affordable and high-class living that Silicon Oasis provides. The lush green surroundings and plenty of local amenities (parks, shopping malls and play areas) will allow one to work in a tranquil setting. Licensing can be bothersome and troubling while setting up a company within a neighbourhood and it’s one factor that can be eliminated when setting up in Dubai Silicon Oasis. The development issues service, trade and industrial licences to companies from all industries listed within the Department of Economic Development (DED). This allows companies of varying sectors (agriculture, technology, construction) to share one space and promote collaboration. The licensing process itself is fast-tracked, so once you’ve made up your mind, it won’t be too long until you see your dream in action. With nearly two thousand villas within its boundaries, Dubai Silicon Oasis offers luxury villas with unparalleled craftsmanship and exceptional amenities. The area has become popular among residents thanks to its low-cost living and the wide variety of living spaces. Dubai Silicon Oasis is located at the intersection of Sheikh Mohammad Bin Zayed Road (E311) and Al Ain Road (E66), next to Academic City. Villas for rent in Silicon Oasis Dubai are present within two communities: Cedre Villas and Semmer Villas. Cedre Villas host over one thousand exquisite villas of three, four and five bedrooms. Within this gated community, the villas are inspired by Arabic and Modern architectural structures. Built within a stellar location, the Semmer Villas ooze luxury and class, offering community amenities and recreational areas. A three-bedroom villa for rent in Silicon Oasis averages at AED 140K when rented unfurnished and AED 155K when furnished. Both Cedre and Semmer Villa communities offer such rentals, although Semmer Villas is exclusive to three-bedroom rentals. These villas for rent in Silicon Oasis offer substantial living spaces and stunning backyard views of the green community. Along with the three spacious bedrooms, these villas also provide a maid’s room and a study room. Add in a powder room to the mix and these villas are a prime example of sophistication and luxury for your family. A 4-bedroom villa for rent in Silicon Oasis, available within the Cedre Villas community, average at AED 160K unfurnished and AED 170K when furnished. Sprawling nearly 4,000 square feet, these villas are a masterpiece of design and craftsmanship. With a modern open-kitchen, spacious balcony, walk-in closets and private neighbourhood, these villas are excellent for the price point. Why Rent in Silicon Oasis? 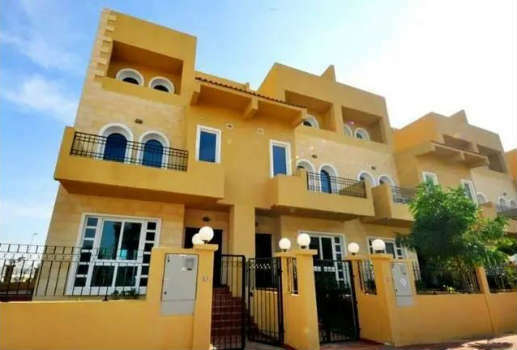 Within Silicon Oasis, villas for rent available are an excellent choice for young families with parents working within the innovative neighbourhood. The neighbourhood has a high number of commercial developments making it a common living destination for people who like to live near their office. Still, for people whose office is based in Downtown Dubai will also find the area highly beneficial to reside in since Downtown Dubai is a short fifteen minutes away (other popular areas such as Dubai International Airport are also close by). Given the large living spaces, families with young kids will find comfort in the plethora of schools and nurseries within the neighbourhood. Older children and young adults studying at popular universities in Dubai (such as Heriott-Watt) will find the proximity to Dubai Academic City extremely beneficial as well. 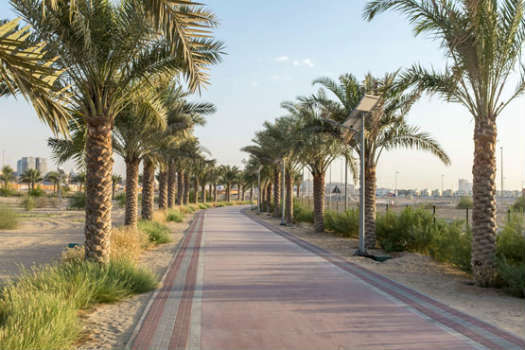 Silicon Oasis offers plenty of open spaces – the newly developed North Park near the Cedre Villas is a great hit among the residents of the area. Providing its visitors with barbeque areas, sports facilities (tennis courts, volleyball courts and football fields) and multiple car parks for its visitors, the park is a great place to be during the summer. 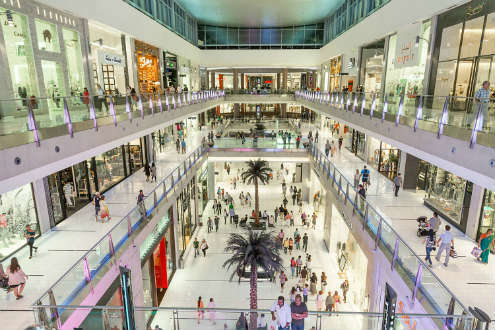 Dubai is the shopping destination of the world and it should come as no surprise that an area such as Silicon Oasis would lack these facilities. Highly budget-friendly options such as Dubai Outlet Mall and Dragon Mart are just around the corner. The community is welcoming and easy-going, hosting many parties for the families within the neighbourhood. Boasting accommodation for over15,000people, Jumeriah Beach Residence is consistently listed as one of the top ten places to live within Dubai. Known for its high-rise glass towers and stunning views of the iconic Dubai skyline, the area is an epitome of the Dubai cosmopolitan lifestyle. The exclusive community, popular among expats and young couples, is located south of Dubai Marina, sitting against the Persian Gulf. Spanning over 17 kilometres, apartments for rent in JBR Dubai are split within 40 residential towers. Built to serve a diverse community with varying living requirements, the JBR apartments for rent include both furnished and unfurnished apartments (and penthouses) ranging from studio to four bedrooms. Studio JBR apartments for rent are tagged at AED 70K unfurnished. Jumeriah Beach Residence consists of six residential blocks, Murjan being popular for studio rentals. Not only does the residential tower offer a gymnasium, swimming pool and parking, but it is also minutes away from The Walk – a small community consisting of beach clubs, premier retail stores and night clubs. JBR 1 bedroom rent is AED 83K while two-bedroom JBR apartments for rent cost an average of AED 100K unfurnished. While Murjan has plenty of one and two-bedroom rentals, the Sadaf community is another option. Much like the rest of JBR, apartments in Sadaf are large – but also include a guest/maids’ room and scenic Marina views. Three-bedroom Jumeirah Beach Residence apartments for rent average at AED 135K annually. Catering to the needs of families with children, Rimal community comprises of a playground and plenty of lush greenery and open space. Moreover, Rimal offers panoramic views of the open Gulf, and with double-glazed sound-proof windows, living within the apartment is luxury at its finest. Similar to all the complexes in the neighbourhood, Rimal also provides a gymnasium, swimming pool, sauna and security. Why Rent in Jumeirah Beach Residence? 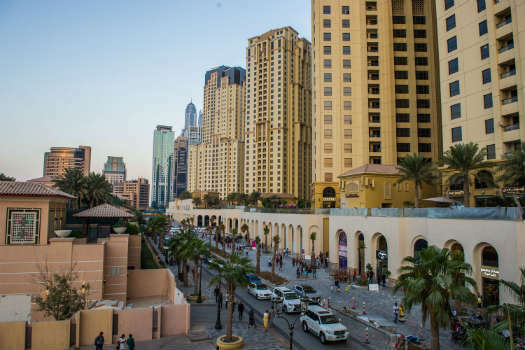 JBR apartments for rent are plentiful and large – however, it’s not the neighbourhood’s only selling point. Firstly, JBR is in close proximity to business districts in Dubai such as Dubai Internet City, Dubai Media City and Dubai International Festival City. Secondly, the area is well-connected: it has two metro stations, as well as, two tram stations located at its two ends. Thirdly, JBR has apartments for even the pickiest renters. From studios to four-bedrooms, apartments to penthouses – there’s an apartment for all sorts of renters. Finally, while aesthetics may not be the utmost priority for most renters, JBR will nevertheless not disappoint. Inspired by Mediterranean and Arabic architecture, JBR has incorporated modern living and an eco-friendly neighbourhood. With numerous beaches, lush landscaping and the glittering towers – JBR is certainly pleasing to the eye. JBR is a premier shopping destination with high-street names and boutique brands at The Beach. There’s plenty of outdoor activities within the neighbourhood thanks to the multiple beaches. The diverse community within the area is reflected in the range of restaurants in JBR. The community is welcoming and keeps itself busy with street markets, a buzzing night life, live music and plenty of holiday-themed events. A recently developed neighbourhood, Dubai Sports City offers a plethora of high-quality living options, leisure hotspots, retail therapy and affordable housing. Filled with busy-bodies, residents are treated to local community events at the five sports facilities that surround the area. Dubai Sports City is located in Dubai Land, along Sheikh Mohammed Bin Zayed Road just off Hessa Street. Villas for rent in Sports City are clustered within two exquisite residential districts: Gallery Villas and Victory Heights. Both communities offer community well-maintained swimming pools, gymnasiums, children’s playgrounds and plenty of jogging pathways. 3-bedroom villas for rent in Dubai Sports City are available for an annual price of AED 135K. Gallery Villas is home to plenty of 3-bedroom villa rentals, each offering large living spaces, private gardens, and stunning views of The Els Golf Club. The gated-community itself is magnificent; lush green landscapes and Mediterranean-inspired villas bordering the neighbourhood streets. Meanwhile, 4-bedroom villas for rent in Sports City Dubai are grounded both in Gallery Villas, but also Victory Heights. Victory Heights is a more popular destination for many prospective residents since it has plenty of homes to offer (over one thousand 4, 5 and 6-bedroom villas). 4-bedroom villas can be rented for an average AED 180K annually. Also, 5-bedroom and 6-bedroom villas can be rented at AED 250K and AED 400K on average. Each villa within this community comes in three distinctive styles: European, Mediterranean or Spanish. Similar to Gallery Villas, houses within this neighbourhood are exposed to the scenic views of the Ernie Els Golf Course. Tenants can enjoy the large rooms, high-quality kitchen cabinets and granite countertops. Why rent in Dubai Sports City? There are plenty of reasons why Dubai Sports City has been successful in gaining interest from prospective tenants this past year. In terms of location, the development is based in New Dubai, close to popular commercial destinations such as Business Bay, Jebel Ali and Al Barsha. Moreover, unlike its neighbours, Dubai Sports City offer affordable rentals given its prime locality. Young families are eager to move to Sports City as the high-class and well-reputed Bradenton Preparatory Academy finds its home in the neighbourhood. Additionally, the area offers plenty of opportunities for families with young kids to partake in summer courses, local sports centres and community activities. While the local shoppers can be found in City Centre Me'aisem and the First Avenue Mall, shopaholics enjoy the luxury retail stores at Mall of the Emirates or Dubai Mall nearby. Of course, Dubai Sports City does live up to its name and is therefore the perfect place to call home for all health, fitness and sports fanatics. The neighbourhood is home to three golf courses, soccer schools, a rugby stadium and the Dubai International Cricket Stadium. The neighbourhood also houses its own Sports Academy that offers state-of-the art facilities training grounds for a range of sports. There is still more to come, with a Rugby Sports Park on its way and a 60,000-seater stadium housing football, rugby, track and field events. Truly, Dubai Sports City has plenty to offer to its residents. While Dubai Sports City lives up to its name (it contains five major sports venues – enough to please fitness fanatics of all kind), one should not overlook its pristine and modern residential complexes. Located in Dubai Land, along Sheikh Mohammed Bin Zayed Road just off Hessa Street, this newly developed neighbourhood is a thriving urban masterpiece. Apartments for rent in Sports City are scattered in within numerous complexes such as the Canal Residence West, Elite Sports Residence and Giovanni Boutique Suites. These residential complexes reflect modern Venetian, Mediterranean and European architecture; built with the finest details in mind. 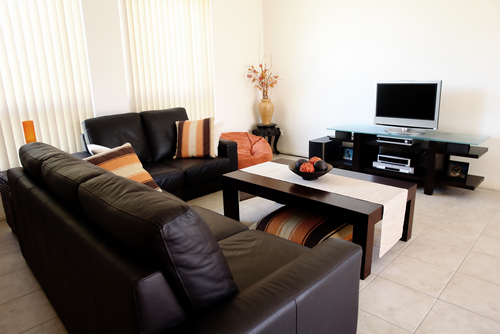 Furnished apartments for rent in Sports City are plentiful and rest-assured, high-quality. Not shying from its name, the area has dedicated several towers to sport-related titles such as the Golf View Residence or the Cricket Tower. Dubai Sports City is becoming increasingly in-demand due to its affordable rentals. A studio apartment can be rented at AED 28K unfurnished and AED 33K furnished. Elite Sports Residence is a popular choice for furnished rentals while Canal Residence West is popular for unfurnished rentals. Still, both provide excellent gymnasium and sauna facilities, round-the-clock security and pool access to its tenants. Although the occasion to call the management is rare, prompt management service is promised to the renters. A one-bedroom apartment for rent in Sports City is tagged at AED 40K unfurnished and AED 45K furnished. Champions Tower offers plenty of one-bedroom rentals with a golf course view and common amenities. 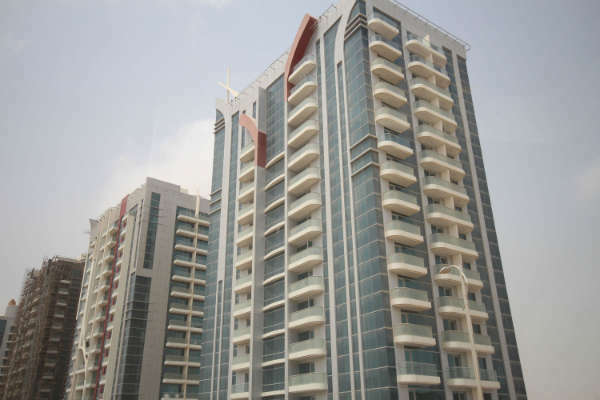 Two-bedroom apartments for rent in Sports City – while present at Elite Sports Residence – can also be found at the aptly-titled Olympic Park tower. Costing AED 58K unfurnished and AED 65K furnished, these apartments are not only spacious, but also offer multiple fitness facilities. For larger families, three-bedroom apartment can be rented at AED 78K unfurnished and AED 90K furnished. Dubai Sports City offer an exquisite style of living to the right niche of individuals. In particular, the idealistic location of the neighbourhood makes living here favourable for those working within the development or nearby areas such as Business Bay, Jebel Ali and Al Barsha. If dining out is popular within your household, Sports City is a perfect match. The neighbourhood is home to plenty of trendy Instagram-worthy cafés and other multi-cultural restaurants. 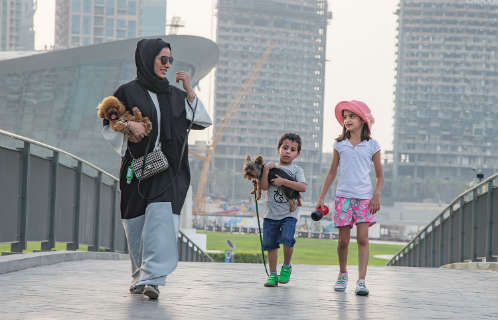 Residents enjoy going to the nearby Kite Beach during the weekends, and shopaholics can fulfil their urges at Mall of the Emirates or Dubai Marina Mall. Lastly, it should come as no surprise when we say that Sports City is heaven for fitness fanatics. 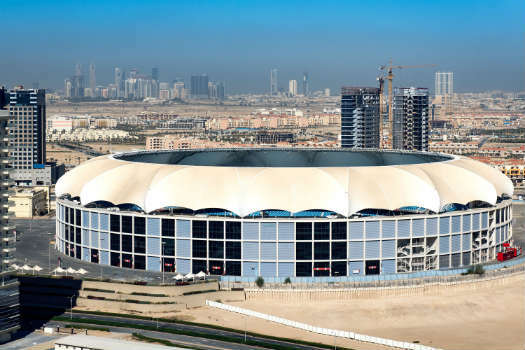 Setting aside the multiple grand stadiums built within the vicinity (Dubai International Cricket Stadium, for instance), the area has its own Sports Village that offers training grounds for a range of athletics. Golf is also much-loved by the residents of this neighbourhood, with The Els Golf Club located nearby. So, if fitness and health is of particular importance to you, you will find plenty of like-minded individuals within Dubai Sports City. Studio flat in Dubai are plentiful and a great option for singletons or couples who live independently. These flats often consist of one single large room that serves as the living, dining and (sometimes) bedroom. Not only are these living spaces cozy, they are also extremely affordable! Eager to please all types of rental demands, furnished studios come in varying prices, furnishings, neighborhoods and sizes. Upscale and luxurious rentals can be found in Downtown Dubai, The Address Downtown is a popular choice with prices tagged at AED 100K annually. Nearby areas such as Jumeirah Lake Towers, Barsha Heights and Dubai Marina also offer furnished studio apartment in Dubai. Not only do these studio rentals come with furniture, you are rest assured that the furniture is high-quality and that the kitchen and bathroom are well-equipped. Moving further from new Dubai, International City has plenty of furnished living spaces available. The recently developed area has various clusters such as Spain, France and Greece which offer rentals averaging AED 22K yearly. Set within a similar price range, Dubailand, Dubai Production City and Discovery Gardens also offer fully furnished studio for rent in Dubai. Why rent a furnished studio in Dubai? Fully furnished studio apartment for rent in Dubai are a great option, allowing you to have a living space without having to worry about furnishing the space. These rentals are helpful for individuals moving from abroad, who are new to Dubai or even those who are moving to their own apartment for the first time. Furnished rentals provide a unique experience for the tenant as they provide a hotel-like feel and at the same time, a welcoming environment to call home. These are ideal for students who have just moved out of their parents’ houses, newly married couples or singletons who are living on their own for the first time. The rentals would also be beneficial for individuals who are looking for last-minute rentals and those who don’t have time for furniture hunting. Finding a place to call home is a tricky and stressful process but renting a furnished space removes the added element of ‘moving in’. Moreover, one can save money that would have otherwise be spent on setting up the living environment. The presence of high-class equipment and good furniture means that you won’t have to worry about spending time at the stores either. Along with being time-efficient, furnished rentals in Dubai offer plenty of high-class amenities that include parking, security, gymnasium and swimming pools. A few studio rentals also offer gaming rooms, concierge services and laundry. Depending on the location, each neighborhood has plenty to offer to its potential tenants. As a cosmopolitan city, Dubai has plenty of supermarkets and clinics littered at every corner. Dubai has always been home to a diverse community, and large amounts of its population consists of young entrepreneurs, bachelors and couples. Therefore, it should come as no surprise that the city offers a great variety in studio living spaces. Firstly, in terms of areas: studio flat for rent in Dubai are found in nearly every neighborhood in town. Within New Dubai, there are studio apartment for rent in Dubai Marina, Downtown Dubai, Sports City, Internet City, Discovery Gardens and more. The average rental price for a studio flat in Dubai Marina is AED 48K to AED 50K annually. However, the price is worth the product – not only are these studios well-presented and luxurious, they are all relatively new and offer stunning views of the waterfront. If you’re looking for affordable studio for rent in Dubai, living spaces in Old Dubai are a good bet. There are ample studio flat in International City, Bur Dubai, Muhaisinah and Mirdif among many others.Studio apartment for rent in Dubai Bur Dubai is tagged at AED 35K yearly, while studio for rent in International City costs AED 25K annually. These studio flat for rent in Dubai often benefit with free parking, modern fixtures and a great community. 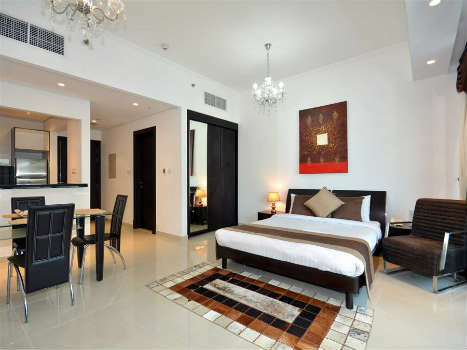 Studio for rent in Dubai also come in furnished and unfurnished options. Renting a furnished studio are usually cost and time-effective. However, if you’re picky with your furniture and sentimental about your new home, unfurnished studio apartments are always available around the city. 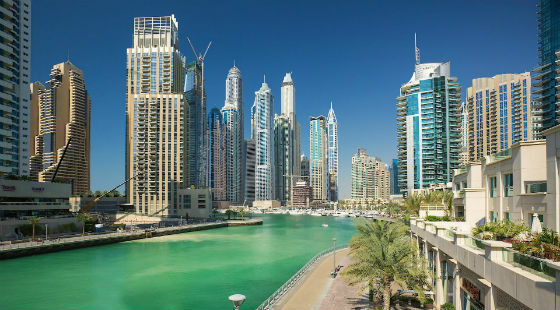 There are plenty of furnished studio for rent in Dubai Marina, Al Barsha, Motor City, Qusais, Dubai Land, Dubai Production City, Jumeirah Beach Residence, Jumeirah Lake Towers and elsewhere in Dubai. Furthermore, studio apartment for rent in Dubai vary in layout: few studios offer a closed kitchen system while others merge an open-kitchen layout to the living and dining area. Why Rent a Studio Apartment in Dubai? Studio apartments are great for a certain niche populations: students, singletons, couples. The affordable pricing is great for students on a tight budget and there are plenty of housing options available in Academic City and Knowledge Village. Moreover, studios are also beneficial for expats who have just moved to Dubai and are still figuring the city out. There are plenty of short-term rentals available – although, yearly rentals are more popular. These living spaces offer more than just affordable housing: tenants can benefit from high-class furnishings, 24-hour security, gymnasium, swimming pools and sometimes gaming rooms, concierge services and laundry. Often times, studio rentals are clustered within one apartment building and therefore, socializing is easy when you’ve got singletons or young couples like you living within the same residential housing. Of course, regardless of the location, Dubai offers a great nightlife, shopping opportunities, healthcare facilities and day-to-day services. Jumeirah Lake Towers is a multi-purpose neighbourhood developed along three artificial lakes. The development has become increasingly popular among potential tenants due to its prime location, excellent amenities and welcoming neighbourhood. Jumeirah Lake Towers is sandwiched between two arterial highways: Sheikh Zayed Road and First Al Khail Street. Within JLT, apartments for rent are organised within 26 clusters, ensuring plenty of rental space availability. There are plenty of options to choose from in terms of the number of bedrooms and furnished options. On average, an unfurnished one-bedroom apartment for rent would cost AED 55K annually at towers such as New Dubai Gate and Lake Point Towers. A furnished one-bedroom apartment, on the other hand, is tagged at AED 65kK on average and Lakeside Jumeirah Lake Towers has plenty of openings. Despite the higher price, furnished rentals are a score for individuals who are in a rush to rent, have just moved to the city, or are not too keen on furniture shopping. 2 bedroom apartments for rent in JLT average at about AED 78K yearly. Icon Tower 1 and Goldcrest Views provide two-bedroom rentals, although, there are plenty of other towers with similar living spaces. Since most towers are high-rise skyscrapers consisting of 40 floors on average, you are sure to enjoy the morning views of the waterfront community. 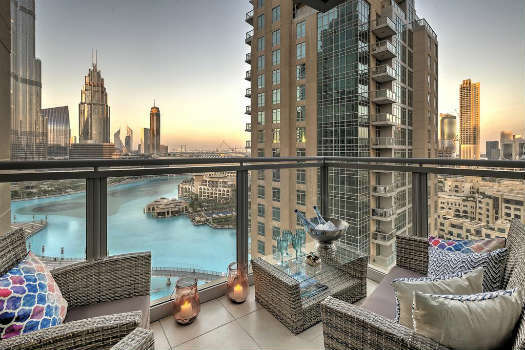 3-bedroom apartments for rent in Jumeirah Lake Towers cost AED 90K annually. The neighbourhood does provide four and five-bedroom living spaces, with the former present Global Lake Tower. Why Rent in Jumeirah Lake Towers? As mentioned earlier, JLT is a highly sought after neighbourhood and there are plenty of reasons why you should consider this unique neighbourhood. Firstly, the location: developed in New Dubai, the neighbourhood is a few minutes away from commercial districts in Dubai such as Business Bay (20 minutes), Downtown Dubai (20 minutes) and Al Quoz (15 minutes). Moreover, the multipurpose development has plenty of commercial activity within its 68 commercial towers. Secondly, compared to its pricey neighbours, JLT is known for its affordability as well. Moreover, the ample variety of living spaces means that the neighbourhood welcomes bachelors, young couples, small and large families allowing for a diverse living experience and services catered to your needs. Because there are so many clusters and such a wide variety, these apartments vary in style and amenities. However, all towers provide fitness centres, Jacuzzi, swimming pools, and round the clock security. The variety in living spaces means that you can enjoy the eating options at over 300 restaurants, cafes and bars. Living within JLT means you can benefit from its two metro stations: DMCC (near cluster D) and DAMAC Properties (near Cluster S). Although Dubai has plenty of shopping options, JLT has gone fairly overboard. Dubai Marina Mall, Ibn Battuta Mall and Mall of the Emirates can all be accessed under fifteen minutes. Safe to assume that convenience is right on your fingertips, here at JLT.